Communities across the world came together Sept. 10 in honor of World Suicide Prevention Day, a day set aside each year to provide commitment and action against suicides across the globe. There are more than 44,000 suicides each year in the U.S. alone, according to the American Foundation for Suicide Prevention(AFSP)—an organization that raises awareness, research and education on suicide. 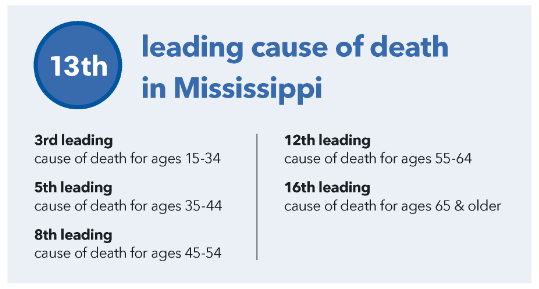 It is also the 10th leading cause of death in the U.S. and 13th leading cause of death in Mississippi. Organizations such as the National Suicide Prevention Lifeline and The Trevor Project—a nonprofit organization focused on suicide prevention efforts among lesbian, gay, bisexual, transgender, and questioning youth—provide hotlines available 24/7 for individuals who may be contemplating suicide. The Mississippi Department of Health instilled a program known as the Mississippi Youth Suicide Prevention Project in 2012, which aims to prevent suicides for residents between the ages of 15 to 24-years-old. Locally, Oxford and the University of Mississippi both offer resources such as the Oxford Counseling Center and the Ole Miss Counseling Center. The Ole Miss Counseling Center worked as a vital tool for Ole Miss graduate Dylan Lewis. Lewis said in a previous story—LGBTQ Reflections: Accepted Into Ole Miss—that the counseling center helped in times of trouble. “I will forever be thankful for my time at Ole Miss because of the counseling center… and the time they put in,” he said. Lewis said his counselors saw his potential and saw him as more than a student—as a human being. That experience ultimately led him to be involved as an orientation leader and ambassador for Ole Miss. If you or someone you know is contemplating suicide, call the National Suicide Prevention Lifeline at 1-800-273-8255 or visit their website for more information.